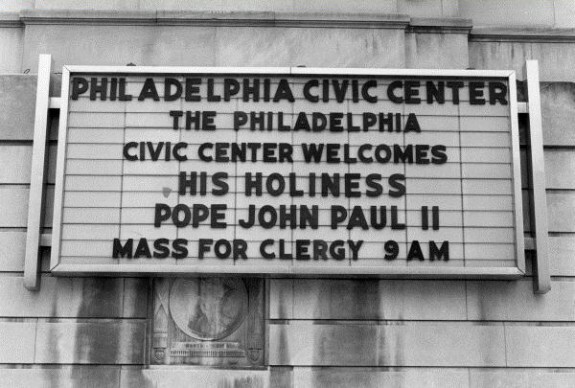 This sign at the old Civic Center in 1979 heralded Pope John Paul II's visit to Philadelphia, during which he held two Masses, one in Logan Circle for the public and the other at the Philadelphia Civic Center for 10,000 priests and 3,000 nuns. During Pope Francis's 2015 visit to Philadelphia, two Masses were scheduled, the first at 10:30 a.m. September 26 at the Cathedral Basilica of Saints Peter and Paul for local religious and those with personal invitations. The second, open to the public, occurred on September 27, when the pope celebrated the closing mass for the World Meeting of Families. 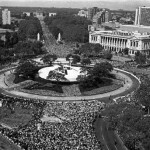 He officiated from a stage in Eakins Oval in front of the Philadelphia Museum of Art. The public Mass held in Logan Circle on October 3, 1979, drew more than a million people, according to police estimates at the time, stretching on the Benjamin Franklin Parkway from City Hall to the Art Museum. 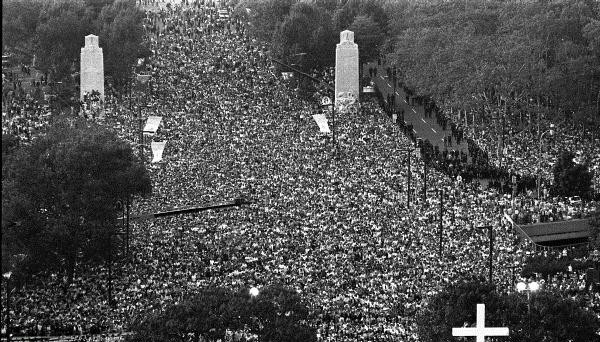 Although the one million attendance figure has been widely used since Pope John Paul II's 1979 visit, and organizers at the World Meeting of Families 2015 predicted more than one million people would attend a parkway Mass on September 27, recent appraisals by crowd specialists say that the parkway can hold only about 400,000 people. Organizers set up giant screens beyond the parkway to handle the overflow. In 1979, the papal stage and altar at Logan Circle brought controversy as Mayor Frank Rizzo spent $205,569 of public funds during its construction. A lawsuit filed by the American Civil Liberties Union against the City of Philadelphia argued that using public money to build the stage amounted to “public sponsorship of a religious service.” The city lost the lawsuit and the Archdiocese of Philadelphia reimbursed the costs of the construction. 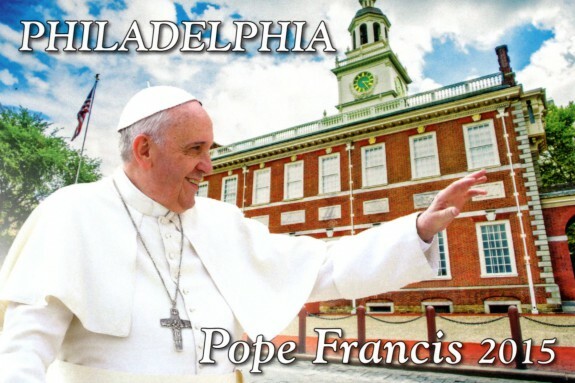 To avoid a similar issue with the 2015 visit of Pope Francis, the City of Philadelphia made clear that the $45 million in expenses for the papal event would be paid by the World Meeting of Families, covering all religious and nonreligious aspects of the visit. During the 1972 to 1980 tenure of Mayor Frank Rizzo, a time of white flight to the suburbs and increases in crime rates, taxes, and poverty, tensions ran high between white residents and African Americans. In this context, in the Cathedral of Saints Peter and Paul, the pope prayed that everyone in the region would “succeed in making your inner city and suburbs places where people are no strangers to each other, where every man, woman and child feels respected; where nobody feels abandoned, rejected or alone.” In his homily at the Mass in Logan Circle that followed, John Paul urged the hundreds of thousands in attendance to preserve the human and Christian values—especially liberty and justice—of the city’s and the nation’s heritage. Pope John Paul II (1920-2005), shown here, was the only other pope to make an official visit to Philadelphia, on October 3 and 4, 1979, as part of his first trip to the United States as pope. Popes use their visits to encourage faith, emphasize their priorities, and fulfill their role as pastors. The places visited use these trips to highlight their successes, history, and culture on an international stage. Security measures in 2015 were far more robust than in 1979. The first papal visit had no secure vehicle perimeter to block traffic, nor was there screening of visitors with magnetometers or high fences severely restricting access to the principal papal venues. The 2015 visit, designated a National Special Security Event by the U.S. secretary of Homeland Security, led authorities to implement unprecedented travel restrictions, criticized by some as excessive. These measures included closing the Benjamin Franklin Bridge, the Vine Street Expressway, and large stretches of the Schuylkill Expressway to private vehicles and preventing incoming traffic into the three-square-mile papal security perimeter, shown here, for the entire weekend. This postcard peddled by a vendor on Market Street, anticipated the arrival of Pope Francis at Independence Hall, where he spoke about immigration and religious freedom. Popes use their visits to encourage faith, emphasize their priorities, and fulfill their role as pastors. The places visited use these trips to highlight their successes, history, and culture on an international stage. Prior to the visit of Pope Francis (b. 1936) to Philadelphia on September 26 and 27, 2015, only one other pope had made an official visit to the city. Pope John Paul II (1920-2005) came on October 3 and 4, 1979, as part of his first trip to the United States as pope. 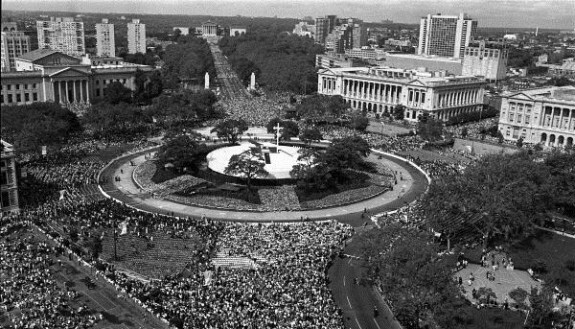 As Cardinal Wojtyła, he had visited Philadelphia in August 1976, representing Pope Paul VI at the International Eucharistic Congress during the celebration of the nation’s bicentennial. John Paul II enjoyed a close relationship with John Cardinal Krol (1910-96), archbishop of Philadelphia (1961-88), a fellow Pole with whom he shared similar views concerning theology and church discipline. The large Catholic population of the archdiocese (more than 1.3 million), the historical significance of the city, and the pope’s friendship with Cardinal Krol were all factors in Philadelphia’s selection for a visit. 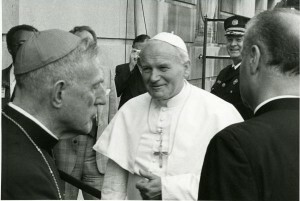 Before Philadelphia, John Paul II visited the General Assembly of the United Nations in New York, where he enunciated themes repeated in Philadelphia: the dignity of the human person, fundamental human rights, and the primacy of spiritual and moral values over material and technological progress. In 1979, Philadelphia was like many other urban centers, experiencing declining influence relative to the suburbs. During the 1972-80 tenure of Mayor Frank Rizzo (1920-91), a time of white flight to the suburbs and increases in crime rates, taxes, and poverty, tensions ran high between white residents and African Americans. In this context, in the Cathedral of Saints Peter and Paul, the pope prayed that everyone in the region would “succeed in making your inner city and suburbs places where people are no strangers to each other, where every man, woman and child feels respected; where nobody feels abandoned, rejected or alone.” In his homily at the Mass in Logan Circle that followed, John Paul urged the estimated 400,000 participants to preserve the human and Christian values—especially liberty and justice—of the city’s and the nation’s heritage. Before leaving, the pope met with seminarians and priests, Hispanic Catholics, and Ukrainian Catholics. 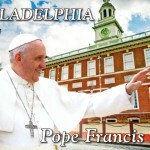 Philadelphia’s second opportunity for a papal visit emerged in connection with the city’s hosting of the 2015 World Meeting of Families, a triennial event established by John Paul II to encourage discussion of the challenges and contributions of family life. 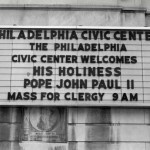 The two-day papal visit was planned to encompass the meeting’s concluding events, a family festival (September 26) and a Mass on the Benjamin Franklin Parkway (September 27). 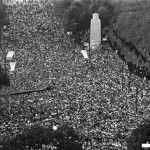 Organizers projected that the Mass featuring the pope would draw between one and two million people. In addition to appealing to the local Catholic community, the prospect of a second papal visit also drew support from civic and business leaders eager to encourage business opportunities and tourism by presenting Philadelphia as a city of global stature. A delegation including Robert J. Ciaruffoli (b. 1951), a top executive at accounting firm Baker Tilly, and Daniel Hilferty (b. 1957), Independence Blue Cross CEO, joined Mayor Michael Nutter (b. 1957), Governor Tom Corbett (b. 1949), and Archbishop Charles Chaput (b. 1944) in flying to Rome in March 2014 to encourage the pope to come to Philadelphia. The religiously diverse Executive Leadership Cabinet of the World Meeting of Families also reflected broad support. The pope’s vigorous engagement with contemporary issues added to public interest in the visit, as evinced by newspaper articles, op-eds, and letters on the subject. Since his election in March 2013, the pope called for serving the urgent needs of migrants and refugees, protecting the environment, and making economic systems more just. He also sought to persuade the Church to be more concerned with compassionate service to all, especially the marginalized, rather than with a rigid adherence to doctrinal orthodoxy. His message resonated not only with Catholics, but also with many others. At the same time, the pope’s insistence that humans had a moral obligation to become good stewards of the earth, instead of degrading the environment and inflicting suffering on the poor across the globe, led some conservatives to argue that the pope should steer clear of forays into “scientific” matters. Like John Paul II before him, Francis’ arrival in Philadelphia followed an address at the United Nations in New York. Echoing themes from that address, in Philadelphia Francis—using the same lectern that Abraham Lincoln used to deliver the Gettysburg Address—spoke about religious freedom and immigration at Independence Hall on September 26. He also met with selected prisoners and their families at the Curran-Fromhold Correctional Facility before celebrating a concluding Mass on the Benjamin Franklin Parkway on September 27. While the two papal visits have many similarities, fund-raising for the 2015 visit of Pope Francis differed from its 1979 precedent. In 1979, after Mayor Frank Rizzo announced that the city would cover the $205,569 expense of the platform and decorations for the public Mass, the ACLU filed and won a lawsuit against Philadelphia for violating the First Amendment. In 2015, no public funds were to be used to cover the estimated $45 million cost of infrastructure, security, and cleanup for the World Meeting of Families and the papal visit. A development committee chaired by Eustace Mita, CEO of Achristavest, a waterfront development company, led the fund-raising. In addition to appealing to local businesses, foundations, and individual philanthropists for most of the needed funds, the committee created opportunities for supporters to purchase merchandise online, to donate $10 to light a candle for one’s intentions at the Cathedral Basilica, and to designate the World Meeting of Families as a preferred charity to receive a percentage of purchases made on Amazon.com. Security measures in 2015 were also far more robust than in 1979, which preceded the era of the 9/11 attacks and the rise of al Qaeda and ISIS. The first papal visit had no secure vehicle perimeter to block traffic, nor was there screening of visitors with magnetometers or high fences severely restricting access to the principal papal venues. The 2015 visit, designated a National Special Security Event by the U.S. secretary of Homeland Security, led the city to implement unprecedented travel restrictions, criticized by some as excessive. These measures included closing the Benjamin Franklin Bridge, the Vine Street Expressway, and large stretches of the Schuylkill Expressway to private vehicles and preventing incoming traffic into the three-square-mile papal security perimeter for the entire weekend. About one month before the pope’s visit, city officials and World Meeting of Families supporters mounted a campaign to undo negative publicity brought by uncertainties over security and transportation issues, including distribution of “OpeninPHL” kits to downtown businesses and assurances that the city would take the event in stride. Despite the inconvenience caused by the travel restrictions and disruption created by the huge influx of visitors, Philadelphia expected to net more than $400 million in economic benefit from the 2015 papal visit. Hotels and restaurants expected to reap the greatest profit, but local merchants—especially the official retail vendor, Aramark— also stood to benefit from the selling of papal paraphernalia, including the papal bobblehead doll with cheesesteak in hand, T-shirts, coffee mugs, and religious articles. In the final months prior to the pope’s arrival, local media intensified their coverage of the preparations for the papal visit, providing daily updates as their papal clocks counted down to Francis’s visit, expected to be the largest event thus far in Philadelphia history. William Madges, Ph.D., is a professor of theology in the Department of Theology and Religious Studies at Saint Joseph’s University. His most recent publication is a translation of Walter Kasper’s Pope Francis’ Revolution of Tenderness and Love (New York: Paulist Press, 2015). Ivereigh, Austen. The Great Reformer: Francis and the Making of a Radical Pope. New York: Henry Holt, 2014. Pilgrim of Peace: The Homilies and Addresses of His Holiness Pope John Paul II on the Occasion of His Visit to the United States of America. Washington, D.C.: United States Catholic Conference, 1979. Simon, Roger D. Philadelphia: A Brief History. Harrisburg, Pa.: Huggins Printing Co., 2003. Walsh, Mary Ann, ed. John Paul II: A Light for the World. New York: Sheed & Ward, 2003. Weigel, George. 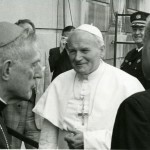 A Witness to Hope: The Biography of Pope John Paul II. New York: HarperCollins, 2005. Weigley, Russell F, ed. Philadelphia: A 300-Year History. New York: W.W. Norton, 1982. 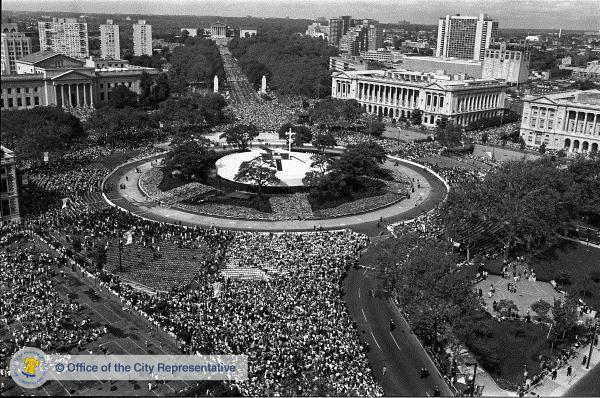 Papal Visit-John Paul II 1979 Collection, Philadelphia Archdiocesan Historical Research Center, 100 E. Wynnewood Road, Wynnewood, Pa.
Cathedral Basilica of Saints Peter and Paul, Eighteenth Street and Benjamin Franklin Parkway, Philadelphia. St. Charles Borromeo Seminary, 100 Wynnewood Rd., Wynnewood, Pa. Temporary exhibits related to 2015 visit of Pope Francis (listed by Philly.com).